With its wide sky and warm earth, Princess Gie Gie’s kingdom is a beautiful land. But clean drinking water is scarce in her small African village. And try as she might, Gie Gie cannot bring the water closer; she cannot make it run clearer. Every morning, she rises before the sun to make the long journey to the well. Instead of a crown, she wears a heavy pot on her head to collect the water. After the voyage home, after boiling the water to drink and clean with, Gie Gie thinks of the trip that tomorrow will bring. And she dreams. She dreams of a day when her village will have cool, crystal-clear water of its own. 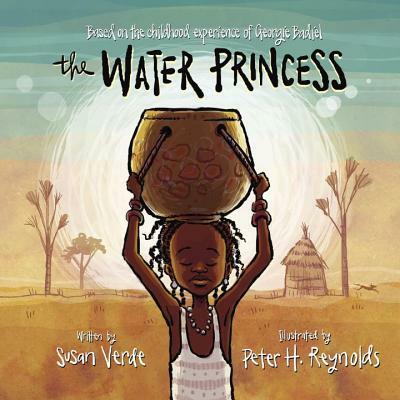 Inspired by the childhood of African–born model Georgie Badiel, acclaimed author Susan Verde and award-winning author/illustrator Peter H. Reynolds have come together to tell this moving story. As a child in Burkina Faso, Georgie and the other girls in her village had to walk for miles each day to collect water. This vibrant, engaging picture book sheds light on this struggle that continues all over the world today, instilling hope for a future when all children will have access to clean drinking water. Susan Verde grew up in a brownstone in the heart of Greenwich Village. She spent much of her time as a child clad in bell bottoms and rainbow suspenders, roller skating up and down her block with a skate key around her neck and a piece of chalk in her pocket (for spontaneous hopscotch). Susan's love of literature began in utero (according to her mother) and never dwindled. She can, to this day, relate very well to Amelia Bedelia. After spending a number of years working as an elementary school teacher, Susan now writes and teaches kid’s yoga in East Hampton, New York, where she lives amidst an explosion of Legos, art supplies, and picture books with her twin boys, Joshua and Gabriel, and her daughter, Sophia. They are the constant inspiration for her writing. They never let her forget how to see things from a child's point of view and keep the kid in her alive and kicking. Georgie Badiel is a high-fashion model who hails from the landlocked country of Burkina Faso. After she won the title of Miss Africa in 2005, Georgie’s profile continued to soar as she appeared on the runways of designers such as Oscar de la Renta, Louis Vuitton, and Diane Von Furstenberg and was featured in editorials for magazines including Russian Vogue, Essence, and Elle. The Water Princess is inspired by her childhood in her small village in Burkina Faso. Peter H. Reynolds is an author and illustrator, as well as the founder of the educational media company FableVision. Reynolds is best known for his children’s books about authentic learning, creativity, and self-expression. His picture books include The Dot, which has been published in over twenty languages, and the New York Times bestseller Someday by Alison McGhee. Reynolds lives in Dedham, Massachusetts, and is the co-owner of his family’s book store, The Blue Bunny Bookstore.